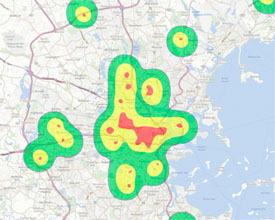 Great Boston leads the nation with the most expensive lab space. Greater Boston’s life sciences rental rates have climbed 7.4 percent this year to reach an average rate of $47.40 per square foot, outstripping other top markets including Raleigh/Durham, North Carolina (up 12.4 percent year-over-year to $19 per square foot); San Francisco (16.9 percent, $37.30); San Diego (15.5 percent, $29.90); New York/New Jersey (8.3 percent, $24); and Los Angeles (4.9 percent, $30.70)…In Cambridge specifically, the average lab rent is $51.60 per square foot, the report said. The report also said tenants are currently on the hunt for around 1.3 million square feet of space in the city. 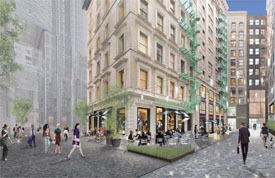 Six buildings in Boston’s Financial District, Congress Square, are set for complete renovation by Related Beal. Yes, this should be renamed as it has become a landmark in our city. Boston is confusing to navigate; Uber, Google and Waze have helped, but let’s give one of our new attractions a simpler address. You can read the full article here: Bostinno.Streetwise.co – why this busy downtown Boston road should be renamed after The Greeenway. 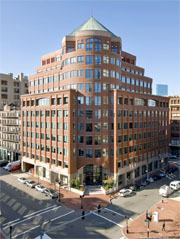 Boston office rents continue to grow as tenants continue to migrate to downtown Boston high-rise office buildings. Low-rise and Class B offices are now commanding rents in the mid- to upper $40s range, while high-rise rents are reaching well past the $90 per square foot range, according to second-quarter research from commercial real estate services firm DTZ. Class B office rents are up 21 percent from last year in the Financial District, 12 percent in the North Station region and 20 percent in South Station, DTZ said. “It’s also worth noting that nearly 25 percent of Boston’s office inventory has traded hands in the past 12 months,” the research report said. Meanwhile, Cambridge also maintained its post as the strongest real estate market in Massachusetts, with $2.2 billion in sales activity. 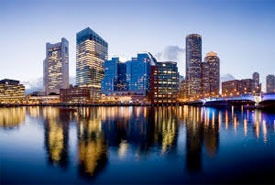 That’s more than half of the overall $4 billion in total sales volume so far this year, according to recently released second-quarter research from JLL..Direct average rents rose more than 5 percent year-over-year in nine out of 12 of Boston’s submarkets, topping out with 16.3 percent growth in East Cambridge. 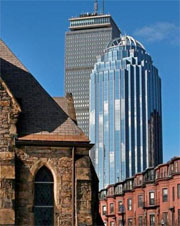 Fewer options exist on the Boston office market, and what is available is more expensive then previous quarters. Combined with fewer concessions offered by landlords, local tenants are feeling the pinch. 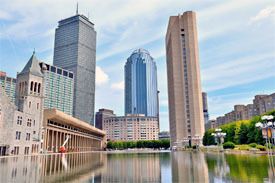 Boston’s office market is hopping, according to reports issued by real estate brokerages Transwestern and Jones Lang LaSalle. Driven by strong employment gains and growing companies in need of additional space, rents are rising all across Greater Boston, up 7.6 percent in the last 12 months. Throughout Cambridge, there are just three vacant office spaces of 20,000 square feet or more on the market, and rents in Kendall Square are averaging above $70 per square foot. Along Route 128, vacancy rates are at record lows, while office rents along Interstate 495 are at seven-year highs. The pilgrimage to Boston continues as Cambridge tightens; InsightSquared and Architectural Resources will soon call Back Bay home. You can real the full Boston Business Journal report on its website, here. Boston Fire Fighters will be better equipped when responding to a call. Our first responders will now be equipped with information from a variety of city departments, including Inspectional Services and Permitting. Streaming data will provide an array of relevant data to the fire truck while on route to a call; this will hopefully mitigate hazards along the way, and keep the fire fighters up-to-date on all necessary info related to the call. Fire trucks will soon be outfitted with what the city calls “building intelligence” software that taps into records and data from other city departments, including Inspectional Services and Permitting. That will let firefighters know the building’s floor plan, whether it has sprinklers and potential hazards in the building…Before entering a building, firefighters will also have access to information about whether the structure has a history of code violations, including illegal apartments. The greater Boston audience has an opinion about just about anything, including our skyline. This poses a challenge to Boston’s strongest developers and architects to reshape our city into something elegant, energizing, and functional. No matter how elegantly they may be paved or planted, urban plazas are boring, windy, and little used, especially in weather like ours. 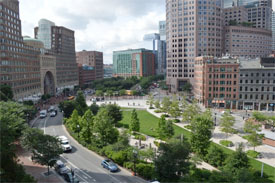 The Prudential, back before its Arctic plazas were filled in with shopping arcades, was a good example. The Federal Reserve Bank, next to South Station, is another. It’s a handsome, eloquent Diva tower behind a plaza that has the charm of a recently abandoned battlefield. As far as the public is concerned, cities aren’t made of buildings and plazas, anyway. Cities are made of streets and parks. From the point of view of urban design, the buildings are there to shape those public spaces and feed them with energy. Changes are on the move for East Cambridge. 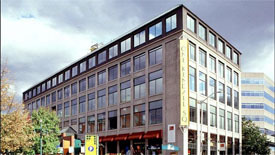 Vertex’s old HQ in Kendall Square is poised to be remade. 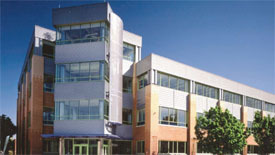 The deal will enable Biomed to begin renovating the buildings. 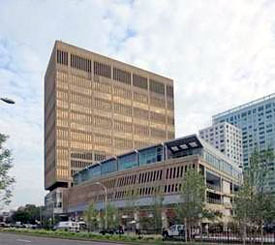 They include two lab and office buildings at 200 Sidney St. and 40 Erie St., with a total of 239,000 square feet, that were leased to Vertex through this December, and another 21,000 square feet at 21 Erie St. that was leased to Vertex through May 2017. Biomed said it will update the buildings’ entrances and lobbies, and add indoor and outdoor collaboration spaces and fitness centers. The work will begin immediately and the sites should be ready to be leased to new tenants starting in September, the developer said.